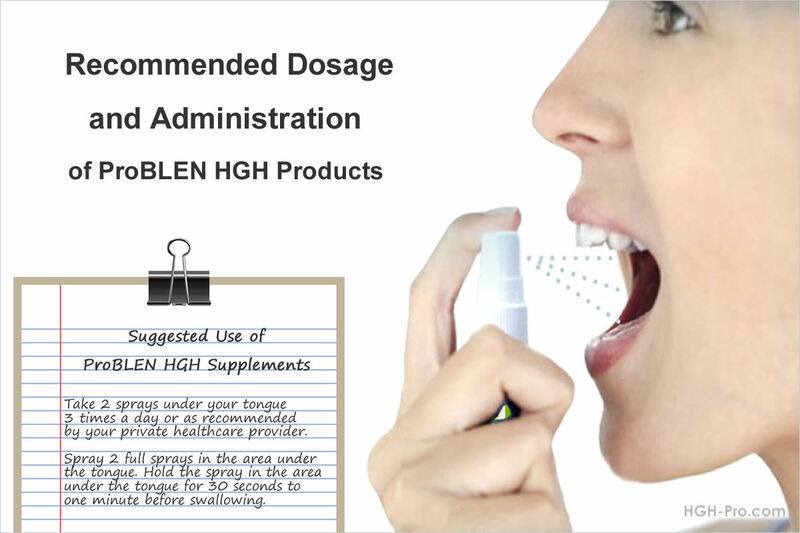 The route of administration for our HGH products is "sublingual", which means the active ingredients are absorbed directly into the bloodstream through the mucosa under the tongue. Our products are not absorbed in the stomach. Suggested Usage: Take 2 full sprays under the tongue 3 times a day, or as recommended by your healthcare provider. Spray 2 full sprays under the tongue, then hold the liquid in the area under the tongue for about 30 seconds to one minute to give the active ingredients time to be absorbed. After that time any small remainder of liquid may be swallowed. The mucus membranes of your mouth should be clean, you may rinse your mouth with water, but you should not brush your teeth or gargle with mouthwash just before taking your dose (see explanation below). First Dose: The first dose should be taken immediately upon awaking, the first thing you do. Second Dose: The second dose should be taken in the afternoon. Those who exercise in the afternoon should take this dose about 30 minutes before exercise. For those who do not exercise in the afternoon, any time between 2 PM to 4 PM is a good time to take this dose. Remember, this is the "middle of your day dose" so it can be moved depending on your schedule. Third Dose: The last dose should be taken at bedtime. Do not take this dose too early, it should be taken no more than 30 minutes before you go to sleep in order to receive the most benefits from the dose. Cycling: The first 3 months is considered the loading phase. During this time the product may be taken every day. After the first 3 months the product should be cycled by taking one day off each week. Our HGH sprays are cycled by taking the product for 6 days and taking each 7th day off. It is also recommended to take a week off after completing each 3 months of therapy. Dose Times and Eating: You do not need to take the product on an empty stomach, however, because eating and drinking can cause an increase in glucose and insulin it is best to not eat or drink for about an hour before or after your dose. Water can be taken at any time, in fact, we recommend rinsing your mouth with water immediately before taking your dose to clean out any previous food particles. Those who cannot wait one hour before or after eating to take their dose should do the best they can. If you take your morning dose when you first awake but you only have time to wait 20 or 30 minutes before eating breakfast then go ahead and eat. Breakfast is the most important meal of the day. You should not miss a meal because of taking your HGH product. It is generally said to be preferable to not eat for about 4 hours before bedtime, and this is recommended when taking our products also. However, some may find this hard to do. If you are used to eating closer to bedtime you should not drastically change your schedule all at once because you may feel tired when you awake in the morning due to your body not being accustomed to going that long without food. The product should work if you do not eat for 2 hours or even one hour before bedtime. Taking With Other Health Supplements: You may continue to take your vitamin, mineral, herbal, and amino acid supplements per their schedule while taking our products, as they won't interfere with each other. In fact, the benefits should be better if your body has all the nutrients it needs to do the healing and cell building work that HGH will ask it to do. Taking With Our Other Products: You may take any of our other products along with our HGH products. Please see the dosage instructions for all ProBLEN products and Combos for information about how to take our products together in a Combo. The Question of Avoiding Mint and Coffee: Some homeopathic physicians believe that anything that contains strong scents should be avoided. One of the most common substances some homeopaths recommend we avoid is mint, and anything that contains mint such as toothpaste, mouthwash, chewing gum, etc. Today there is much debate as to whether mint has any effect on homeopathic products. It has been believed by some that Dr. Samuel Hahnemann, the creator of homeopathy, forbade the use of mint and other strong smelling substances while taking homeopathic therapy. However, there are others who have stated that new research in the original language of Dr. Hahnemann's writings has shown this may not be the case. Since we cannot say for certain that mint and other strong scented substances won't have any effect on the effectiveness of our product we recommend our clients avoid these substances if possible. Clients should have a clean mouth and not have any food flavors lingering. It is a good idea to rinse the mouth with water just before taking a dose. Mint free toothpastes are now more easy to find. Some health stores carry mint free toothpastes and you can purchase homeopathically compatible toothpaste by Auromere and Peelu online and in health stores. Eco-DenT Daily Care Tooth Powder is both mint free and fluoride free. *If you cannot find a mint-free toothpaste or mouthwash then make sure to take your dose first and wait a minimum of 20 minutes after your dose before using any mint or strong smelling substances. Some homeopaths believe that coffee may inactivate the homeopathic action of the product if it is taken too close to the dose time. They believe the effects of some homeopathic medicines may be overwhelmed by caffeine, which possesses a strong physiological action of its own. *We recommend caffeinated coffee be avoided at least for one hour before and after your dose. The Importance of a Healthy Diet: The effectiveness of any human growth hormone therapy will depend upon nutrition. The growth factors (IGF-1, IGF-2, etc.) are the messengers that prompt new cell growth to build muscle, rebuild organs, renew skin, etc., but in order for the body to build those new cells it must have the proper building blocks, which comes from nutrition. This cellular work also requires fuel, which the body gets through calories. Eating a well balanced diet that includes adequate protein and complex carbs is recommended as well as taking a good multivitamin, multimineral supplement to help ensure the body has the tools it needs. Dieting For Weight Loss: In order to see the best results it is recommended to eat a balanced diet and not be on any long term nutrient depriving or very fuel restrictive diet that could deprive the body of the nutrients and calories it needs to build muscle, improve the skin, etc. Such a diet can decrease the benefits seen. Fasting: Those who are hoping to lose fat should know that depriving the body of the calories it needs long term may cause the metabolism to slow down and may cause the product to not work as well. However, proper short term fasting should not be a problem and can even stimulate HGH release. Interactions and Contraindications: No known medication or supplement interactions or contraindications. Our HGH products may be taken along with our other products as well as with other health and nutritional supplements. If you have any type of health condition please see our information regarding taking our HGH products when you have health conditions. 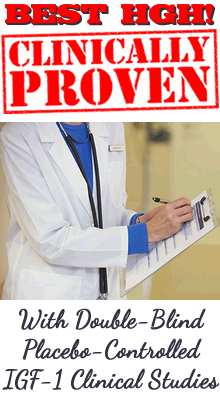 *We do recommend everyone consult their own private healthcare provider regarding taking our products. Side Effects: You should not see the traditional side effects that one may see when taking the injections. However, you might see some homeopathic effects, which are actually a positive sign that the product is working. Please see this page for more information about possible homeopathic effects when beginning our product. If You Are Sensitive to Organic Alcohol: High quality homeopathic products do contain a small amount of organic vegetable alcohol because it helps to hold the potency of the formula stable and enhances absorption. If you are sensitive to alcohol, or if you notice any irritation under your tongue, you can place the sprays in a small amount (10-20 cc) of warm, not hot water for 5-10 minutes to evaporate the alcohol before taking. You should swish the entire liquid around in your mouth for about 30 seconds before swallowing because the ingredients still need to be absorbed through the mucosa of the mouth. Those who can take liquid cold preparations such as Nyquil should not have a problem with the small amount of alcohol in our products. How Supplied: Supplied in light protective 30 ml spray bottles. Each bottle is a 30 day supply. Special Care of the Product: Store at room temperature in a dry place away from electromagnetic sources such as computers, TV's, radios, microwave ovens, x-ray equipment, or other electrical equipment. Do not store near items with strong smells such as menthol, mint, moth balls, hair sprays, perfumes, or any toxic substances. Refrigeration is not necessary. The bottles should not be stored in freezing temperatures. These are precautions, since homeopathic products are quite hardy and stable. All HPUS guidelines are strictly followed in the manufacturing of our products. The bottles are light protective and each bottle is sealed and has an expiration date. Unopened products are stable and maintain potency under normal conditions and care for at least two years. Each ProBLEN homeopathic product is FDA registered with an NDC number. Warnings: If you are pregnant or breast feeding please consult a health professional regarding using any of our products. Keep out of the reach of children. We recommend everyone consult their private healthcare provider before taking any health products or supplements.